Hello! So is everyone having fun going back to the 80s? 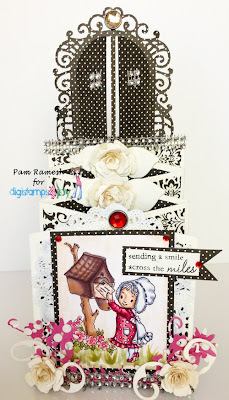 We hope you're enjoying our special blog hop this week and are looking forward to seeing all your birthday creations for "It's Only A Number"! But right now we have a winner and top picks to announce! Thanks to everyone who joined us for our "Fancy Folds" challenge! There were lots of amazing creations! And special thanks to our sponsor, Mayzy Art! Pam, please email us at corrosivechallenge(at)gmail(dot)com to claim your prize from Mayzy Art! Congrats, ladies, and please grab your badges from the sidebar for your blogs! There is plenty of time left to hop for our "80s to the Max" blog hop with sponsor Sassy Studio Designs! A ton of totally rad prizes are up for grabs so don't miss out! And we'd love to see you play along in the challenge as well! Every participant who links up receives a special SSD image for FREE! Have an awesome week and see you on August 11th with the hop winners! AWESOME! I'm so thrilled to have been chosen among the Top 3 winners! Thanks so much! Congrats to ALL the winners! FABULOUS inspiration everyone!! Thank you so much for choosing my card to be in the Top 3! Congrats to the other winners as well! Congratulations to the winners! These are some fantastic cards!